Scientific Name(s): Clitocybe odora (Fr.) P.Kumm. Copyright Holder(s): A thank you to frequent BPotD contributor Damon Tighe@Flickr, for sharing this image of Clitocybe odora. Much appreciated! The compound responsible for some or all of the anise fragrance in organisms so scented is 4-Anisaldehyde. This fungus is no exception. 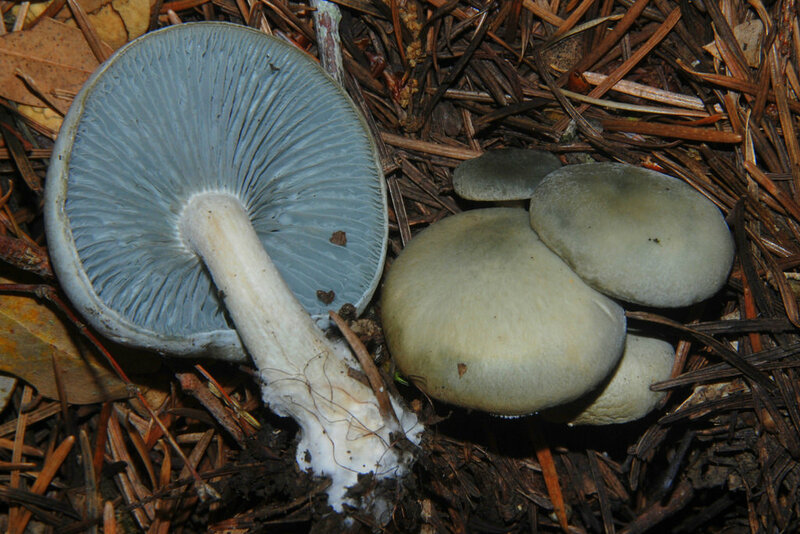 Blue-green anise mushroom or aniseed toadstool smells so strongly of anise that its presence is sometimes initially detected by scent rather than observation. As the fungal bodies age, the anise scent diminishes. It is an edible species, though some resources warn that it should only be eaten at maturity, as it may be confused with other species when developing. The species is widely-distributed, occurring in temperate forests across the Northern Hemisphere. In the western part of North America, it is most often found in coniferous forests. Conversely, it is typically associated with hardwood trees in the east. Given what I know of recent re-examinations of fungal species in North America, additional research is therefore indicated to determine if there are indeed multiple species that look superficially the same. Additional photographs are available from MycoQuébec (Clitocybe odora) and Michael Kuo’s MushroomExpert: Clitocybe odora. Presumably it would be really easy to train a dog to find this one. Lovely – one more mushroom to look for on my walks. Thank you for the Quebec Website they are an amazing organization dedicated to researching and identifying North American mushrooms.